We welcome Saratoga group tours! Tour operators and event planners can turn to the Saratoga Convention and Tourism Bureau to make planning a Saratoga group tour a breeze! View the Event Destination Guide and see how easy it is to explore Saratoga Springs! For a complete list of tour and transportation operators, please click here. Review the bus parking information for downtown Saratoga. Horses: Saratoga is all about racing! World-class thoroughbred horse racing, exciting harness racing and, polo events are signature events that have brought visitors here for generations. History: History lovers have an opportunity to explore the historic Saratoga Battlefield. Relive the sights and excitement of the determining battle of the American Revolution. Culture: Saratoga has long been a summer place, with a cultural profile that includes the NYS Ballet and the Philadelphia Orchestra. The National Museum of Racing, National Museum of Dance, and the renowned Hyde Museum are favorite destinations. Skidmore College offers the Tang Museum. Downtown Saratoga: Quaint shops, exquisite dining and entertainment, along with a charming Victorian pedestrian setting provide hours of relaxation. The Beekman Street art district is an up-and-coming art haven not to be missed! Autumn in Saratoga: Saratoga scenic by-ways take on a whole different hue in fall. The strong appeal includes few crowds, the crisp, inviting autumn air, and the stunning colors that blanket the beautiful region of Upstate NY. Easy to get to: Saratoga group tours are just a three to four hour drive from NYC, Boston and Montreal! Thirty minutes north of the NYS Capital city of Albany and Albany International Airport. Central Location: Saratoga is the perfect “hub” for group tours! 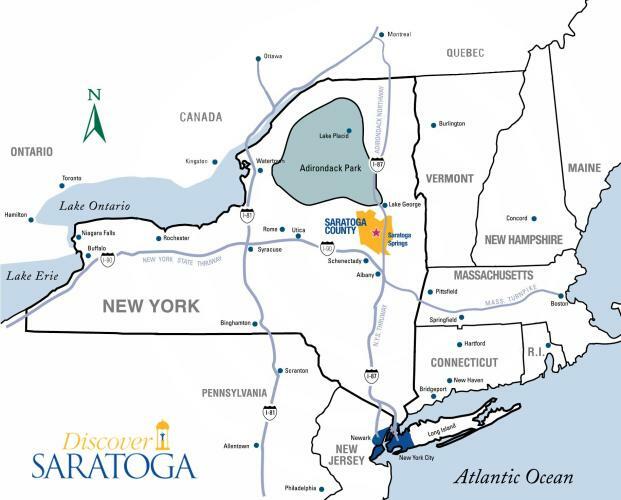 After taking in all Saratoga has to offer, just a thirty minute drive north brings you to the scenic vistas of Lake George and the Adirondacks, and a thirty minute drive south brings you to the historic capital city of Albany and the State Capitol complex. Lake Placid, the Finger Lakes, Catskills, Cooperstown…even Vermont are just a short drive away. Scenic Surroundings: Framed by the foothills of the Adirondack Mountain to the north and west, and by the Hudson and Mohawk rivers to the east and south, travel to anywhere from here is a visual delight. When it comes to historic and scenic attractions, Saratoga is the “crown jewel” in a region rich with gems. Shopping, dining, renowned Saratoga golf courses and close proximity to everything Upstate New York has to offer makes planning Saratoga group tours easy! Rated one of the “Dozen Distinctive Destinations” by The National Trust for Historic Preservation Great American Main Street recognition by American Heritage Magazine as the publication’s first Great American Place. Saratoga Race Course is one of the World’s Top 10 sporting venues by Sports Illustrated.